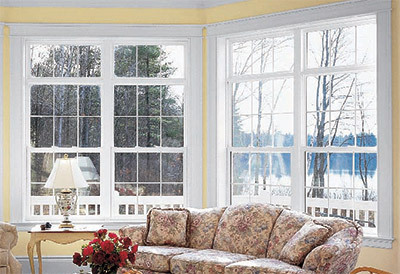 Double hung windows are our most popular replacement windows. They look great anywhere in your home and give you complete control over air circulation. They’re also extremely low maintenance. 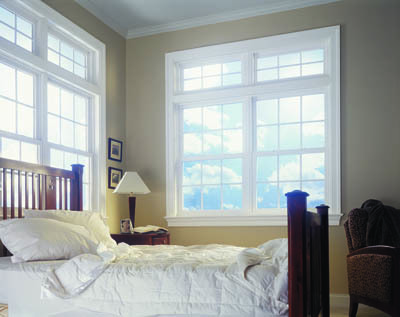 Our double hung windows have two operating sashes – the top and the bottom. With a gentle push or pull of the hand rail, you can open them. Since both the top and the bottom sash of our double hung windows open, you have more control over the air flow in your home. Double hung windows have 3 and 5 inch safety latches that prevent them from being opened any further. This is perfect for when you want to leave your home but don’t want the house to get too stuffy while you’re gone. They’re also great for homes with small children or pets. Double hung windows are made with double pane argon gas-filled glass. The frames have foam insulation as well. This prevents heat and air from escaping which will make your home more comfortable year round. The extra insulation will also save you money on energy bills. Your furnace and air conditioner won’t have to work as hard to reach your desired temperature. There are tilt latches on the top of both sashes of our double hung windows. When they’re both compressed, you can tilt the sashes into your home. You’re able to clean both sides of our double hung windows from inside your home. There are no ladders required to clean your 2nd story windows. Since your double hung windows are made from vinyl, you’ll never have to worry about them warping or rotting. Also, the colors are infused into the vinyl when the windows are made so you won’t have to paint or stain them either. They’ll always look as beautiful as the day they were installed. Double hung windows are our most common window and can be used anywhere in your home. They’re great for keeping your bedroom cool through the night or airing out the kitchen while you cook. There’s no room in your house that couldn’t use a double hung window.